History Maker Homes –Display, Social + Conversion Page | ASTRALCOM - Content Strategy, Conversion Marketing and Customer Acquisition. History Maker Homes –Display, Social + Conversion Page | ASTRALCOM – Content Strategy, Conversion Marketing and Customer Acquisition. 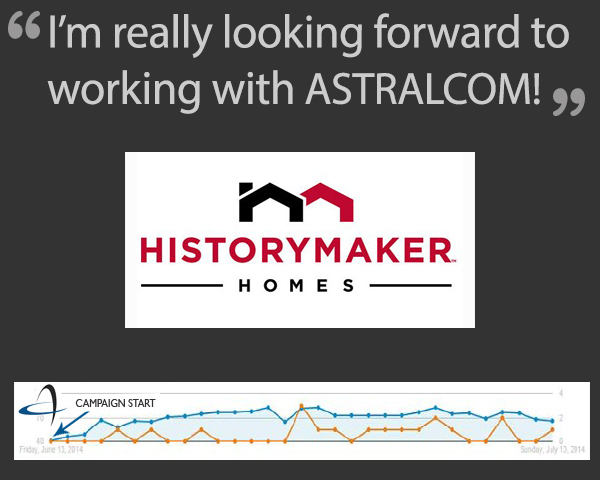 History Maker Homes tapped ASTRALCOM because of our expertise in messaging, our depth of knowledge in the homebuilder/home buyer market and in connecting with Realtors as a part of that home buying process. And connect with Realtors we did! Besides connecting with Realtors and driving more traffic, these campaigns proved successful at lifting brand awareness and at helping convert visitors. · Lifted brand recognition with 800,000+ ad impressions across multiple top sources. · Drove 2,187 targeted referrals driven between both brands. When it comes to delivering real, tangible results, we know how to define and conquer your market, connect with your target audiences and help you sell more. Learn more about our conversion marketing and targeted traffic generation services and contact us today for a friendly chat.